Item # 301400 Stash Points: 895 (?) This is the number of points you get in The Zumiez Stash for purchasing this item. Stash points are redeemable for exclusive rewards only available to Zumiez Stash members. To redeem your points check out the rewards catalog on thestash.zumiez.com. Show off a bit of quirky flair at your next skate park session and rock Toy Machine's No Scooter Black and White Crew Socks. These black and white striped socks offer a plush fit and are featured with jacquard knit graphics located on the ribbed uppers. 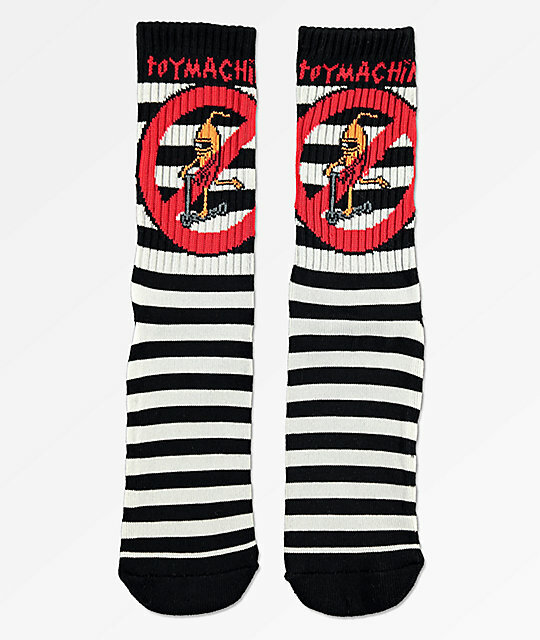 No Scooter Black and White Crew Socks from Toy Machine.